Update: Please note that the cause of "The Ghost Lights" was solved in July 2001 through repeatable, and verifiable experiment. Please read Port Perry - Ghost Road Solved for further information. One of the best known haunts of Ontario, Port Perry's Ghost Road has been the sight of many interesting phenomena and many legends. The legend goes that in or around 1968, a young man was testing the limits of a motorcycle on the old road on Scugog Island. He was on a straightaway pushing the engine as fast as he could. The road is not too long and he soon realized he was running out of road and heading far too fast for the spot where the road meets with the 9th Concession. About 100 meters from the South end near a large tree, he lost control, plowed into a field, caught himself on an old rusty barbed-wire fence and was decapitated. Of course, we've also heard that he simply banged his head on a rock still located on the road and met his end that way. It is this story that goes along with the report of the large round white light heading down the road that when it passes you, turns into a small red light. There are also occasional reports of the sounds of a motorcycle to accompany the light. The light, as examined by several Torontoghosts researchers, actually does exist but does not, as stated, travel down the road. It appears above the road and only if facing South. The image has been caught on film but the pictures belay the fact that the light ain't much to look at. It appears as if it was a small plane some miles in the distance but hovering. Even more intriguing is several people who have investigated the haunting have not been able to find any reports of the death of the motorcyclist in any of the local newspapers of the approximate time of the accident. This has been added to by one group we work closely with getting threatening e-mails from a person related to this possibly non-existent motorcyclist threatening his return to "haunt" the researchers delving into the lights on ghost road should they not stop. Luckily, this threat went unabated and the researchers did some excellent work. 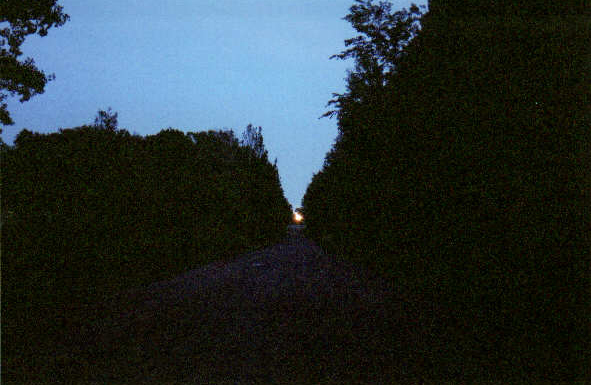 Please note that the ghostlight is caused by car headlights as proven in July 2001 by ParaResearchers Of Ontario. Many groups, and individuals have since repeated their experiments with identical results including in 2007 children's science magazine Owl.